BOARD 2: COMEBACK BOB. 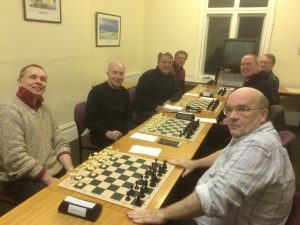 After losing an exchange early on, Bob looked in trouble and every time I took a glance at his game I feared the worst but slowly he got back to an even keel and while we all watched on at the final minutes he gained the upper hand and Clive lost on time. Result: a 2-2 draw We now have played 4 won 0 drawn 3 lost 1 in the Walker Shield. Well done team and well done Margate. Every year has its anniversaries but 2016 seems to have had more than its fair share: the death of Shakespeare, the Battle of Hastings, England winning the World Cup……and now we can add one more that appears to have been overlooked in all the hullaballoo. 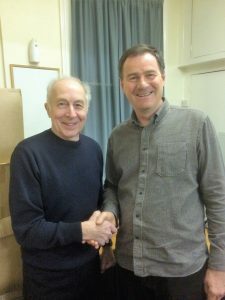 It is forty years since Reg Pidduck joined Broadstairs Chess Club and ten years later Bob Page played his first match. There will be another anniversary of sorts in two years’ time because it will then be twenty-five since they became Treasurer and Secretary respectively of the club. For now, the coincidence of forty and thirty years’ service seemed a good excuse for celebration and so the idea of an anniversary match was born. Twenty players – sixteen from Broadstairs and four friends from local Thanet clubs – were divided into two teams, the Rubies, captained by Reg, and the Pearls, captained by Bob. Each team had equal grade totals and the draw was made on the night. A recipe for numerous mis-matches, I hear you say but not so because this match was run on a fiendish time handicap. With a two-hour limit, the least anyone could receive was ten minutes and when David Faldon (179) was drawn against Viktor Selyukov (73), that is precisely what he got with Viktor getting the remaining one hour fifty minutes. David would still have fancied his chances but the evening got off to a sensational start. Viktor won his game on time to give the Pearls a surprise 1-0 lead. The Rubies soon fought back, however, when Viktor’s twelve year old son, Timofey (111) provided another shock, beating Ian Hames (160). 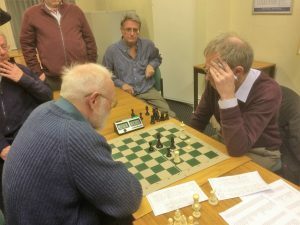 Thereafter the lead swung to and fro as the Pearls’ 3-1 lead became a 4½-3½ defecit – Bob and Reg appropriately agreeing a draw in their match – with two games left. Clive Le Baigue looked likely to win against John Clarke in the all-Margate clash which would make the scores level with just Andy Flood’s game against Colin Gregory. Have a look at the position and see what you think. Typically, Andy said later that if he had known the score he would have offered Colin a draw. In the event, time told as is often the case, Colin made an error and Andy won. The match lasted the entire two hours, by no means a given with time handicaps, which was ideal and everyone then adjourned to the pub with a promise to repeat the match in thirty years’ time. You would have had to stay up late on Thursday evening to see Magnus Carlsen finally break his duck and level the score in the World Championship at 1-1 with two games to go. Who would bet against the Champion now, especially as he has the white pieces in Game 12? Many experts are predicting a tie break, however, which would be decided next Wednesday, Carlsen’s 26th birthday. The theme in this match appears to be the consistency of the players’ inconsistency. True to form, there were moves in this match that puzzled the commentators, none more so than Karjakin’s 20th move. After 20. Nd2 he had the chance to force a draw with 20…Nf2+! He claimed at the press conference that he had overlooked the resulting fork had Carlsen not repeated, winning the queen. Instead he played 20….d5 almost instantly, a move described by one commentator as “one of the most shocking moves of the entire World Championship”! Eventually, Carlsen’s pressure told and after yet another six-hour game it was the challenger’s turn to wilt. BOARD 4 – A NEW SUPERSUB. Last minute sub Michael J. got us off to a flying start with a win against John Heath inside an hour and a half. BOARD 3 – CUT AND THRUST. Every time I glanced at Michael’s game, first one then the other looked in control. Then Michael went an exchange up. I looked again and then Eddie was looking the more dangerous. In the end Eddie wore our Michael down. BOARD 2 – A GREAT WIN. I have always thought Ronnie a very difficult opponent and he always plays better than his 96 grade suggests so our Bob needed to play a solid game against him and Bob came up trumps gaining control with a pawn advantage that Ronnie could not stop. BOARD 1 – A CAPTAIN’S INNINGS? SADLY NOT. Early exchanges were even until Paul gained a centre pawn. I then had to withstand a constant attack to try and maintain a position but to no avail as Paul captured my king. 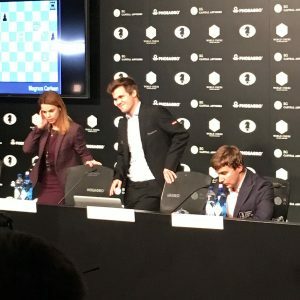 After a series of draws, some more interesting than others, the World Championship finally came alive in Game 8 in sensationally unexpected fashion with a win for the challenger, Sergey Karjakin with the black pieces. Commentators agree that the World Champion has not been playing well and it seemed as if Carlsen was determined to win this game with the advantage of the white pieces. However, over-pressing in time trouble, he blundered with disastrous consequences. His problems did not end there because in frustration he later stormed out of the press conference, a contractual obligation with a 10% deduction in prize money the consequence i.e. a minimum of $40,000. 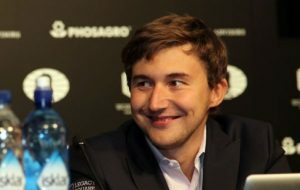 Needless to say, the official Russian chess website celebrated the unexpected win with understandable delight, imaginatively comparing Karjakin’s eighth round ‘knockout’ with Muhammad Ali’s defeat of George Foreman in the same round of the Rumble in the Jungle when Foreman, like Carlsen, was the overwhelming favourite. The difference here is that Carlsen has four more ’rounds’ to recover which Foreman did not. However, the hubris of his statement at the opening press conference (“I’ll punch him until he finally knocks over”), which the Russian blogger, Vladimir Barsky, took great pleasure in repeating, may come back to bite him. Game 9 takes place tomorrow (Wednesday).